Kansas maps from Omnimap, the leading international map store with 250,000 map titles. Kansas Road and Topographic Atlases. Kansas Topographic Atlas & Gazetteer. DeLorme. Excellent atlas using USGS topographic maps. Ideal for hikers or backroad enthusiasts. A sample from the Maine atlas. Kansas Road and City Maps. Kansas Road Map - paper. Rand McNally. A good, detailed, paper road map of Kansas. Includes inset city maps of Hutchinson, Kansas City, MO/KS & Vicinity, Downtown Kansas City, MO; Lawrence, Manhattan, Salina, Topeka, and Wichita. Map size is 28 x 40 inches unfolded. $5.99 62-6890 1 sheet, folded. Kansas Recreation Road Map. Benchmark Maps. 1:633,600. Sample detail from the Kansas road map. $7.95 62-68904 1 sheet, folded. 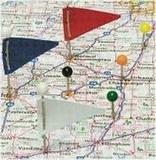 Kansas-Nebraska Easyfinder Road Map - laminated. Rand McNally. The durable and convenient Kansas and Nebraska EasyToFold state map will take all the wear and tear your journey can dish out. The heavy-duty laminated design allows you to mark your route, make notes, then wipe the surface clean for further use. Less detailed than the road map listed above, but handier for use in a car if you are just driving across the state. Size is 18 x 17 inches unfolded. $7.95 62-68902 1 sheet, folded. Kansas Street Maps - paper. Various publishers. $7.99 62-7792KAN Kansas City street map. (Universal Map). $7.99 62-6892TO Topeka and Lawrence street map. (Universal Map). 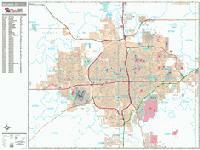 $5.99 62-6892WI Wichita city map. (Seeger Map). These maps offer clear mapping by showing all major streets and roads and many of the smaller streets, but leaving out the smallest streets. If you want a clear map for easy planning, then these are the maps for you; if you want a map showing every little back alley, these are not for you. We offer wall maps for Kansas City, Lawrence, Lenexa, Manhattan, Olathe, Overland Park, Shawnee, Topeka, and Wichita. Click here to order and to see sample images, prices, sizes, and mounting options. Sample detail from the Wichita wall map. We stock the "TransAmerica Cycling Trail" maps for Kansas. We stock a selection of fishing maps for Kansas. We stock all USGS topographic maps of Kansas at all available scales. Kansas National Forest Maps - click here. U.S. Forest Service. We stock the Cimarron Grassland USFS maps for Kansas. Kansas State and County Wall Maps. Intelligent Direct. Kansas Raven Shaded Relief Map. 1:500,000. Raven Maps. From Mount Sunflower and the Great Plains in the west, past the historic Arkansas River, to the Missouri River in the east, Kansas is a state where you'll see gentle rolling plains falling in elevation from west to east. All the subtle changes in topography are shown on this beautiful map of the state. Elevations are represented by color, and this, in combination with our relief shading technique, gives the map a 3-dimensional look. Size is 35 x 58". Kansas Topographic Map. 1:500,000. 1984. USGS. Map size is 33 x 56 inches. The official topographic map of the state of Kansas. Sample detail of the Kansas topographic map. Thumbnail of the Kansas topographic map. $3.95 62-1000KS Kansas flag, small. Size 4 x 6 in. $9.95 62-1001KS Kansas flag, medium.. Size 8 x 12 in. $45.95 62-1003KS Kansas flag, large.. Size 2 x 3 ft.